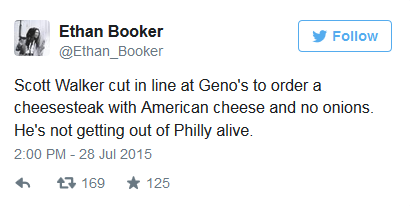 On a July 28 trip to Philadelphia, Wisconsin governor and 2016 GOP candidate Scott Walker whipped the media into a frenzy when he ordered American cheese – instead of the traditional Cheez Whiz – on his Geno's cheesesteak. But we assure you, dairy preferences have little to do with Scott Walker's campaign fundraising strategy. 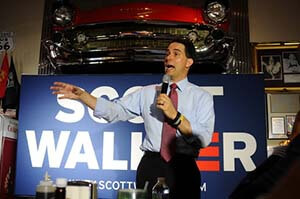 What Is Scott Walker's Campaign Fundraising Strategy? Wisconsin Governor Scott Walker (R) speaks at Joey's Diner in Amherst, New Hampshire, on July 16, 2015. When Walker announced his bid for candidacy July 13, it was no secret that he was entering the race at a financial disadvantage. By this point, other candidates had already amassed millions in funding. For example, Ted Cruz's campaign released an announcement on July 5 touting a $51 million fundraising haul so far. But Walker may not be lagging so far behind his opponents much longer. The candidate's approach to his presidential run involves a small army lead by two seasoned generals. According to a July 7 report on CNN.com, Walker intends to gather a troupe of lobbyists to canvas the entire country to raise money for his campaign. This "army" is led by Jon Hammes, the national finance co-chairman for Walker's campaign. It is funded by Todd Ricketts, co-owner of the Chicago Cubs. The next move for Scott Walker's campaign fundraising strategy is a trip to southern California Aug. 1-3. There, alongside fellow Republican candidates Jeb Bush, Ted Cruz, and Marco Rubio, Walker will try to impress the Koch brothers and their best friends at the "Summer Summit" debate. A good performance there will amount to hefty donations. You know who has a net worth more modest than many of his fellow 2016 presidential election competitors? Sen. Lindsey Graham. In fact, Graham's net worth is well below the $2.7 million average of a U.S. Senator. Here's how much the South Carolina senator makes – how he stands up next to the richer guys in the race….